Scrolling down at the reviews, am I missing something?So help me God, I wanted to like this book, and I did - at first. But then it kept dragging and dragging. I mean, I took four months to read this. The premise sounded uber interesting and I love me a good psychological thriller, but this book grotesquely under delivered.Summary:He watches your every move. He studies you like a mouse in a maze. He knows everything about you--every dream, hunger, weakness, and strength. What you long for and what you fear most. What you live for, and what you cannot live without. He plans to take those things away from you one at a time, invisibly manipulating the events of your life until there is nothing left to live for. Then he wants you to take the final step.Tis' is true.Or is it all in your head?Seemed to be in mine.Is he just a figment of your irrational fear, a face you've given to your terrible misfortune? Everything you love is slipping away. You want to fight back but who, or what, do you fight against?Let the head game begin.But, but, HE FINDS OUT WAY EARLY ON IN THE BOOK.I thought the psychological games would be long and torturous. It wasn't. Some things happened here and there: the protagonist's dog almost being "destroyed," but then the biggest event to occur that really almost sent the protagonist over the edge was a lie about his deceased wife. And he finds out the truth less than 10 pages later! AND he finds out that someone is trying to play him literally right after.I love the message of the book. I love the biblical and spiritual symbolism behind it, but the book would have been better if it had a longer chain of events that were actually psychological. The background stories and character development over shadowed. The events should have been in the spotlight - not the background information.I might try reading more of Downs, but this book didn't do it for me. Intriguing, well crafted story.Hashim certainly "had" each of these guys and was out for revenge. It's amazing how when things go wrong, we second guess so many of our innocent decisions. Nonetheless, very captivating plot and it was great how T. Downs pulled the beginning back in and wove it all together; It was certainly a thrill wondering where everything was headed and how it was all tied together. Well done. Tim Downs has yet to disappoint me. I am amazed at the detail, research and character development that he pours into each novel. This book demonstrates the frailty of the human psyche, and the venom of bitterness and revenge to the human heart. You will love and hate Down's characters, and you will feel deeply as they do. Intensely frustrating, highly entertaining, and keeps you entertained with several unexpected twists. I like Mr. Downs' style. I like his author's voice. I believe I'd like *him* if we met.I'm very much the critic, always looking for plot holes, inconsistencies, factual errors. I may point out a number of troublesome spots, but that doesn't mean I didn't enjoy the story. I did enjoy Head Game, and I most definitely want to read his other works. That means a lot.Here are the major issues: In daylight, I think it would be awfully hard, maybe impossible, to miss someone hiding in the backseat of your sedan as you approach. Wouldn't this particularly be true of someone who'd served in the military, who'd been taught to be ever-vigilant?Bearing in mind my experience as a former breed rescuer and long-term advocate of pet adoption: 1) Shelters frequently do have purebreds available. I personally pulled a cavalier King Charles spaniel and three cocker spaniels from the city's kill shelter. I notified other breed rescuers of purebreds I saw, so they could pull them. 2) As soon as the worker ascertained that the potential adopter was seeking a large dog for defense purposes, he would have immediately called a halt to the interview. Shelters only knowingly adopt out companion animals, not guard dogs. 3) After the potential adopter was bitten, the shelter worker would most certainly have gotten his name and contact info and reported the incident to the higher ups who run the shelter. Like immediately. 4) Since this is a city shelter, I have a hard time believing just one worker is handling walk-ins and showing guests around. Not. Even in rinky-dink city shelters I've visited, there are multiple workers. And this is Charlotte NC.In the instance of a missing child, there is no 24-hour waiting period for police involvement. Author indicated that there was. I don't think any character would drive three hours with his loaded Beretta on the passenger seat. He'd stow it in the glove box. Girls trying on clothes would have to remove said clothes before approaching cashier to pay for them. There's no mention of them returning to the dressing rooms to do this.Ending had some surprises, but I accurately anticipated one of them and another I suspected. This story didn't feel as well researched as Plague Maker. I would have suggested that the author talk to cops and animal shelter workers before finalizing this manuscript.All that said, this is an engrossing story. I read most of the book yesterday and today, and I work a full-time job. I'm generally too distractible to sit and read for hours, but this one held my interest.I look forward to reading more of Mr. Downs' novels. Shame that my library has only two of his though I live in the 25th largest city in the U.S. I stand by my earlier statement (see my review of Plague Maker): I would be honored to meet Mr. Downs in person, and that's something I don't desire of just any author. In fact, I'd love to be one of his beta readers! In the first Gulf War thousands of Iraqi soldiers surrendered after reading propaganda leaflets written and drawn by three men: Cale, Kirby, and Pug. 87,000 lives were saved--at least that's the way those men and the U.S. government saw it.Iraqi Colonel Hashim doesn't see it that way. He considers the PsyOps trio his worst enemies. Because of them and their leaflets he was forced to abandon everything he'd ever held dear: his country, his sweetheart, but most importantly his honor. Fifteen years have passed, and it's time for revenge. Carefully watching and waiting, Hashim knows the men like the back of his hand--and he knows how to hit them where it hurts.Veteran Cale Caldwell is a successful ad agency wonderboy who's storybook life couldn't be better. He has the job, the house, the beautiful wife and daughter. But it all crumbles when his wife dies in a car accident. Her death leaves an aching hole in his heart, and his thirteen-year-old daughter hasn't been the same since. What should draw father and daughter together is shoving them further and further apart. Clueless what to do, Cale isn't prepared for tragedy to strike again. Or to be drawn into the most intense psychological battle of his career. At least in Iraq he was the one creating the head games, and he knew who his enemy was.Downs put a lot of effort into giving his readers a literary experience. Head Game isn't a fluffy action-adventure loaded with explosives and special effects---it's a well-thought out story full of intricate details. Some of the backstory could have been woven into the plot better, but readers will come away with a deeper understanding of the history of the first Iraq war and Middle Eastern thought (the concepts of honor and revenge). And he doesn't skimp on the novel's end, either. 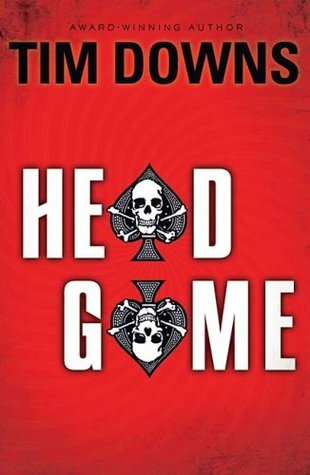 He takes the time to make it satisfying.Tim Downs is creating a mark for himself in suspense fiction, and Head Game is a solid, compelling entry in his bibliography. Closer to Plague Maker than his quirky "Bugman" novels (there isn't a bug to be found in Head Game), Downs raises the bar with this psychological thriller. Right from the comic-esque prologue drawn by Downs himself, you know you're in for something a little different.One of the trademarks of a Tim Downs novel is his ability to immerse you in a world completely different from your own, and that tradition continues with Head Game. There wasn't much to take away spiritually (even less than Plague Maker, which at least had at its core the theme of forgiveness), but that's obviously not what Downs was going for with this story.With a unique premise and several hit-you-between-the-eyes twists, Head Game has all the elements of a blockbuster. What will Downs come up with next? I really had no idea what to expect with this book. I had never read anything by Tim Downs before. The premise to Head Game looked gripping, so I picked it up.I'm glad I did. The first chapter is only a few pages long and in graphic novel format. It doesn't make sense until chapter three. When I read that, I looked at this short comic with new eyes. I'm really glad the author decided to put it in there. It helped tie the story together and it helped show what (view spoiler)[ Kirby was trying to tell those who would find it. (hide spoiler)] (I loved the character of Kirby. His (view spoiler)[ Superman shirt quirk was adorable. (hide spoiler)]The story was as gripping as I allowed myself to believe it would be. It wasn't exactly what I thought it was going to be, but I couldn't quit reading it nonetheless. The end had so many twists I was left inwardly screaming to myself.Well done, Tim. I'll be interested in more of your books in the future. The books starts out with a graphic novel format illustrated by the author, which is different. Although, I didn’t understand the meaning of it at first. Around chapter 3 it explains itself. When I was a few chapters in 'Head Game', I got to where I wanted to finish it, wanted to know what happened, what really is going on. Is the guy (not going to name who as to spoil it) really dead…or was it all a hoax so he could live? Maybe he knew that if he was alive that he would be killed, so he faked his own suicide. What really is going on? All these question and I’m only on chapter 7...Now that I've finished 'Head Game', I realize what was really going on. I really enjoyed reading it and though it doesn't seem to be a CHRISTIAN book (with minimal mentioning of God), it was overall a good read. A few things it said I didn't like, but if you are looking for a book that has suspense/mystery, this is a nice one to read.The ending was dramatic and I thoroughly enjoyed it. So, I wasn't blown away. Overall, the book is good and an easy read, but the villain is a little unbelievable. His resources are a little too vast and his planning a bit too orchestrated. Toss in a Shaymalan twist every two pages, and you're forced to look at the story's action from a distance. Because frankly, you're very aware that you're reading a fictional story. With so many revelations packed into so few pages, I feel a bit like the old Scooby Doo cartoons. As the viewer, you're left out at the conclusion because the characters have been operating on information that you never got. That always rubbed me the wrong way, so too here, I feel like the author leaves the reader out at several turns, because his hidden machinations produce results we have no reason to expect. Let's be honest, I picked this up thinking it was something a bit different. Not normally a genre I;m into and military isn't a favored subject of mine (although the military was background info to be fair).Did I enjoy this book anyway? YES!It was a very fast and engulfing read and played out very much like a Summer Action Blockbuster. In fact I wish it would become one, because I would be lining up in theaters to see it.The pacing was well done, the various vantage points of different characters was quite enjoyable, and the thrills were fast and fun. I believe I have found another author to add to my list of "favorites". This book is simple, yet engaging, and will keep you on the edge of your seat until it wraps up....definitely a must read for anyone who is into psychological thrillers! There is also some awesome insights into spiritual and psychological warfare! Tim Downs offers another psychological thriller that does not dissapoint. Downs manages to drive home a deep spiritual point without ever preaching anything. In Plague Maker, Downs delt with forgiveness and Head Game he confronts pride. Down also avoids the increasingly annoying habit of leaning on gratuitous violence as a crutch for a good story. This is one of the best books I've read in a while. I couldn't put it down. I had to know what happened next and why. Before, I had only read Tim Downs' stories about Nick the "Bug Man". Now I must look for more of his other books. I like his Bug Man series, and while this was a little more predictable, I enjoyed it too. Nick is a forensic entomologist. He's funny and you learn interestingly gross facts about "bugs" and how they interact with corpses. Tim Downs is one of my favorite authors. This is a different character than Nick Polichak (the Bug Man). I was surprised at the twist at the end even though I should have expected it. War, terroism, and phychological operations. totally unexpected ending-- and i usually am pretty good at picking up clues. good mystery. The book starts strong by really slows down and the plot gets messy. The psy-ops plot point is great and could have offered more, but it's quite predictable, or for me I saw the 'twists' coming. As any good suspence book, this one keeps you guessing. Tim throws some curveballs in this one which adds to the fun. Good for a distraction but the ending was WAY weak . . .
Not my usual genre, but I stole it from Andrew. Good suspense thriller book. I guessed part of the ending, but not enough to detract from the storyline. Recommend if you like Tom Clancy type novels. Thought I had it pretty well figured out, but nice twists at the end! Awesome read! What a twist at the end! Didn't see it coming at all....scary though what our minds can do under stress and trickery! LOVE this author!!!!!!!! Kept me going until the end! Found myself playing my own head game. I own it,but I haven't read it yet. Tim Downs - Tim Downs is a Phi Beta Kappa graduate of Indiana University. After graduation in 1976 he created a comic strip, Downstown, which was syndicated by Universal Press Syndicate (Calvin & Hobbes, Doonesbury, The Far Side) from 1980 to 1986. His cartooning has appeared in more than a hundred daily newspapers worldwide. Tim has written seven mystery/suspense novels: Shoofly Pie, Chop Shop, PlagueMaker, Head Game, First the Dead, Less than Dead, and Ends of the Earth. PlagueMaker was awarded the Christy Award for the best CBA mystery/suspense novel of 2006, and Less than Dead was a finalist for the 2009 Christian Book Award in suspense fiction. Tim lives in Cary, North Carolina, with his wife Joy. They have three grown children.